Jetsun Pema was born on June 4, 1990, in Thimphu, the capital and largest city of Bhutan. Her father, Dhondup Gyaltshen, is a commercial airline pilot, and her mother, Aum Sonam Chuki, is a descendant of one of Bhutan's oldest noble families. Jetsun's maternal grandfather was also the half-brother of Mayum Phuntsho Choden and Mayum Pema Dechan, sisters who were both queen consorts to Jigme Wangchuck, the second King of Bhutan. She is the second oldest child of five children, with two brothers and two sisters, and her older sister is married to the King’s brother. So, while Jetsun Pema is considered a commoner, she has many royal family connections. Jetsun Pema’s early education was spent in Thimphu, but as a teenager, she spent her high school years studying at a private boarding school in India. While there, she studied English, history, economics, geography, and painting. She also served as the captain of her high school basketball team and still plays in local tournaments when she has time. After graduating high school in 2008, she studied abroad at Regent’s University in London where she majored in International Relations and studied a shared minor in Psychology and Art History. Being fluent in Dzongkha, the official language of Bhutan, Hindi, and English, Jetsun Pema was well-prepared to serve as Queen of Bhutan on the international stage. The 31-year-old bachelor king surprised everyone on May 20, 2011, when he announced during the opening of Parliament’s seventh session that he was finally engaged and would marry that same year. The country was thrilled to hear the news that their popular king would finally marry and bring a queen to the tiny kingdom. While many were surprised that their new Queen of Bhutan was a 21-year-old student, they were quickly won over by her beauty, grace, and modern style. It is popularly rumored that the happy couple first met in 1997, when he was 17 and she was just 7-years-old, at a family picnic in Thimphu. As King Jigme Khesar Namgyel Wangchuck has famously told the story, he claims to have proposed to the little girl by bending on one knee and telling little Jetsun Pema that when she grows up, he would like to marry her if they were both still single and in love. As it turned out, just 14 years later, they both found themselves single and ready to marry, fulfilling that long-ago marriage proposal. On October 13, 2011, Jetsun Pema married Jigme Khesar Namgyel Wangchuck, the fifth King of Bhutan in a traditional Buddhist ceremony. The wedding ceremony was held in the old capital of Punakha, in a seventeenth century fortified Buddhist monastery known as the Palace of Great Happiness. Beginning at 8:20 a.m., a time set by the royal astrologers, the King began his procession up the steep stairs to the monastery. Jetsun Pema, his commoner bride, crossed an ancient wooden footbridge and joined her groom at the altar. Surrounded by red-robed monks, colorful flag-bearers, and happy revelers, the royal wedding celebrations began with singers, drummers, and trumpets. The bride wore a stunning traditional wraparound skirt and gold jacket with wide red cuffs and colorful embroidered details that instantly established Jetsun Pema as the world’s newest royal style icon. The King wore a royal yellow sash over a gold robe and his traditional multicolored boots. Bhutan’s top cleric presided over the wedding by performing a purification ceremony in front of a 100-foot tapestry, representing Zhabdrung, the seventeenth century monk-king and founder of Bhutan. The lavish, traditional ceremony was broadcast on state television and around the world, making it the largest media event in Bhutan’s history. The entire country celebrated the nuptials with three days of national wedding festivals. Immediately following the wedding ceremony, the official coronation of Bhutan’s new queen began in the temple. The king’s father presented the new bride with five colorful scarves that represented the blessings of Zhabdrung’s sacred tomb. The bride then approached her husband at his throne where she offered him a golden chalice filled with the ambrosia of eternal life. The king then came down from his throne and placed the hand-sewn silk Crown of Druk Gyaltsuen upon her head, which literally means the Crown of the Dragon Queen. The formal proclamation of Ashi Jetsun Pema Wangchuck was then announced, officially making her the new Queen of the Kingdom of Bhutan. The royal love story that has captured the hearts of the Bhutanese people, and the world has been a fairytale for both the royal couple and their subjects. In this tiny Himalayan country that did not allow foreign television broadcasts until 1999, public displays of affection are uncommon. Yet, when the royal couple began courting, the king was often seen openly showing affection, such as holding his bride-to-be’s hand and publicly kissing her on the cheek. Since both the king and queen were educated in London, their open affection for each other is not unusual by Western standards. The isolated nation was not used to these displays, but these actions were very well-received by the younger generation, and many are now seen following the examples of the popular royal couple. After asking a crowd of revelers at their wedding if they would like to see the newlyweds kiss, the king responded by kissing his new bride on the lips for the whole world to see, which received applause. After their wedding, the King and Queen of Bhutan went on a royal honeymoon to India, touring the country on a luxury train that was specially arranged for them by the government. For nine days they traveled by rail from New Delhi to Jaipur, Jodhpur, and finally Udaipur. Customized coaches were specially designed to provide the couple with their own drawing room, dining room, bedroom, private kitchen, and a separate area for the royal aides. Specialized catering, personalized services, and enlarged windows for viewing the countryside were provided to the newlywed couple. The king and queen share a great love of their neighboring country, and spent much of their honeymoon sightseeing, touring museums, and meeting with the local people. While they famously vowed to make it a working honeymoon, they also met with dignitaries along the way. With her breathtaking beauty and elegant style, this young wife has quickly become known as a style icon for her traditional outfits and modern styling. 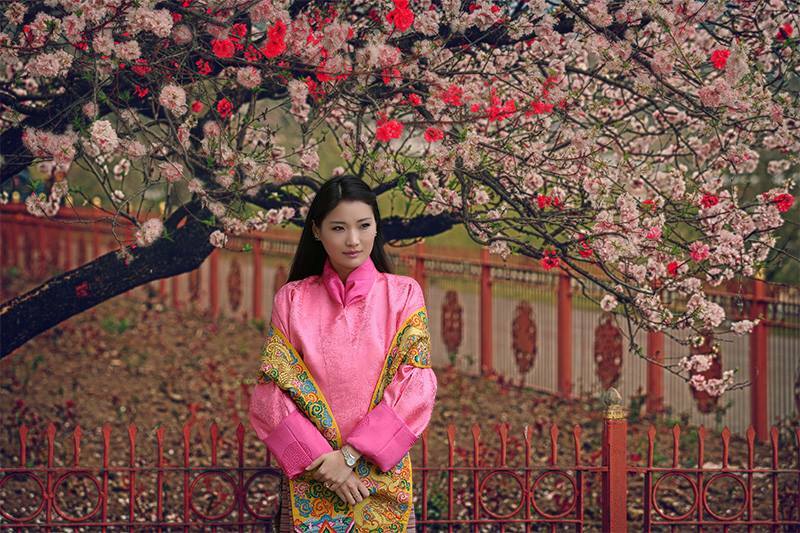 The gorgeous, brightly colored outfits of Bhutan that she is regularly seen in have captivated the entire world. The gold silks and intricately embroidered designs of every color of the rainbow that she wears has made her the modern day Jackie Kennedy or Princess Diana of Asia. While she is usually seen out in her locally designed Bhutanese fashions, she is just as fashion forward when wearing western style outfits. While in the UK, the Bhutanese beauty wowed the British public with her modern, chic style and classic good looks. While the couple could easily live their lives in isolation, these modern royals choose to reside in a modest cottage where they are famously known to invite members of the public in for a cup of tea and a friendly chat. Often compared to another modern royal couple, the Duke and Duchess of Cambridge, who were also married in 2011, the King and Queen of Bhutan similarly enjoy the simple royal life between their official duties of royal business. Since becoming Queen of Bhutan, Jetsun Pema has traveled with her husband on official business abroad to India, Singapore, Japan, and the United Kingdom. The couple has also made a point of traveling to different cities, or throughout the countryside of Bhutan and is often seen interacting with the local people. The queen has many causes that she supports and is a strong advocate of environmental issues. She is a patron of Bhutan’s Royal Society for the Protection of Nature, which is actively involved in environmental research and the conservation of endangered species. She is a close supporter of special needs children and serves as a patron to the Ability Bhutan Society which helps improve the lives of people with disabilities. Above: Queen Jetsun Pema accompanying The Fifth King on Merak Sakteng Trek. 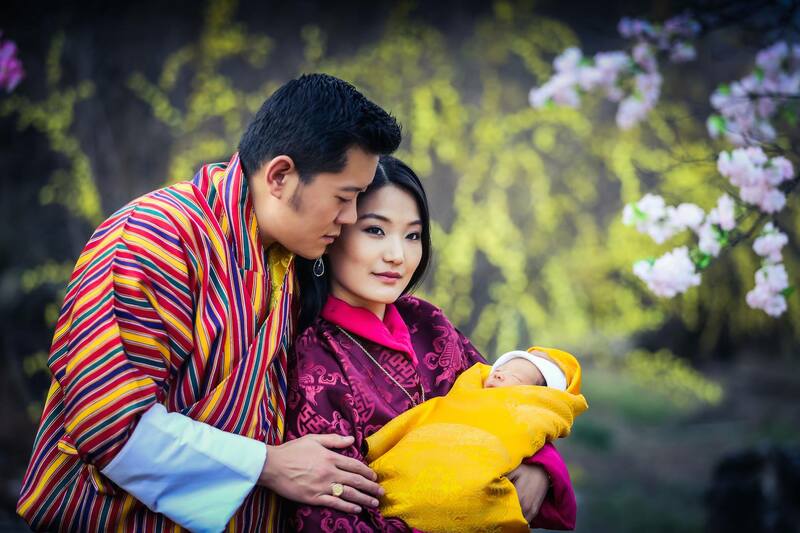 On November 6, 2015, the news of a royal pregnancy was announced to the world and the people of Bhutan learned that Jetsun Pema was expecting their first child, a son. The announcement was made during the national birthday celebrations for Jigme Sinye Wangchuck. This fourth King of Bhutan famously abdicated the throne in 2006, so that his eldest son could begin serving the people. 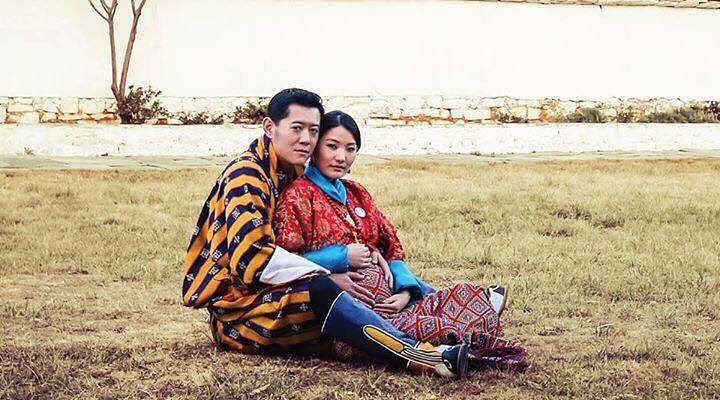 This announcement means that the heir to the throne, the future sixth Druk Gyalpo, or Dragon King of Bhutan, will be born in early 2016. His Royal Highness The Gyalsey was finally born on the 5th of February 2016. Planning to travel to Bhutan during a festival? On popular dates of travel such as during festival time, flight tickets tend to get fully reserved 5 months prior. Due to limited flight and seats available, we recommend you to reserve your ticket as early as possible. You can reserve your ticket for free with us and plan your trip to Bhutan with a peace of mind knowing that you will have a spot on your flight to Bhutan.